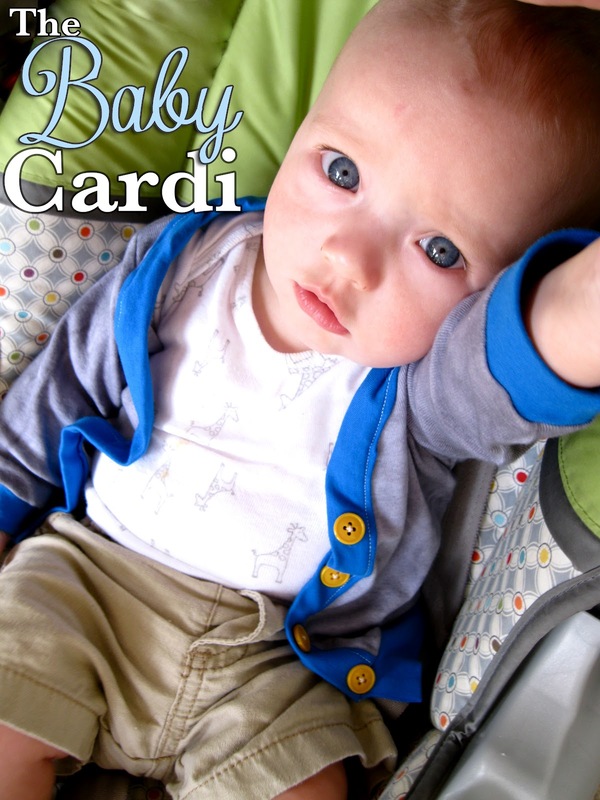 Everyone needs to know how to make a baby-sized cardigan sweater! I'll admit up front that this tutorial was 100% inspired by this tutorial. However, I wanted to make a cardigan that was more like a real sweater and less like a onesie dressed up as a sweater. I also sewed my contrast on differently, but maybe the original way was easier. Anyway, check out her tutorial if at any point my directions aren't making sense. 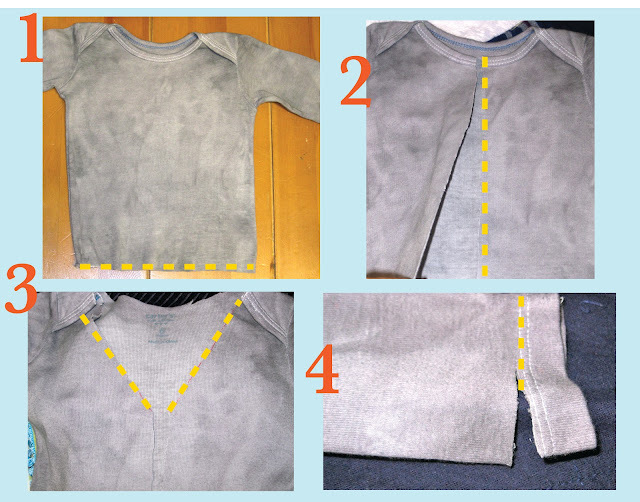 So I started with a white long-sleeved onesie which I dyed gray. DISCLAIMER: if you're going to dye something, it's a good idea to actually follow the directions on the box so you don't end up with a splotchy mess like I did. Let's just pretend I was going for a "vintage" wash..
Sew the little shoulder flaps down, and we're off! 1. Cut of the snaps, as close down as you can get without keeping any of the leg opening. 3. Draw a horizontal line across the chest however deep you want the V neck to be. Then use a straight edge to draw diagonal lines from the shoulder flaps to the horizontal line. Cut the V AND the entire hem all the way around the neckline. 4. Cut off the hem of the sleeves. 1. One piece long enough to go from the bottom, up one side, around the neck and down the other side (the raw edges from steps 2 and 3 above). About 2.5 in wide or DOUBLE however thick you want the contrast band to be + .5" for seam allowance. 2. One piece a little shorter than the entire bottom edge and 3.5 in wide or however wide you want doubled + .5. 3. Two pieces a little shorter than the circumference of the sleeve edge and same width as the long piece in step 1. 1. Fold all contrast pieces in half and iron. I know, ironing is the worst, but you'll be glad you did. Iron the fat piece for the bottom with the right sides facing IN. 2. Start at the base of your center cut and sandwich the onesie between your nicely ironed piece of contrast. Fold the raw edge of contrast under about 1/4" and pin. Do this all the way around the neck until you get to the bottom o the opposite side. 3. Sew the contrast down the way you pinned it, staying fairly close to the edge. If you want it to look nicer than mine, use matching thread. 4. Take one of the arm band pieces. 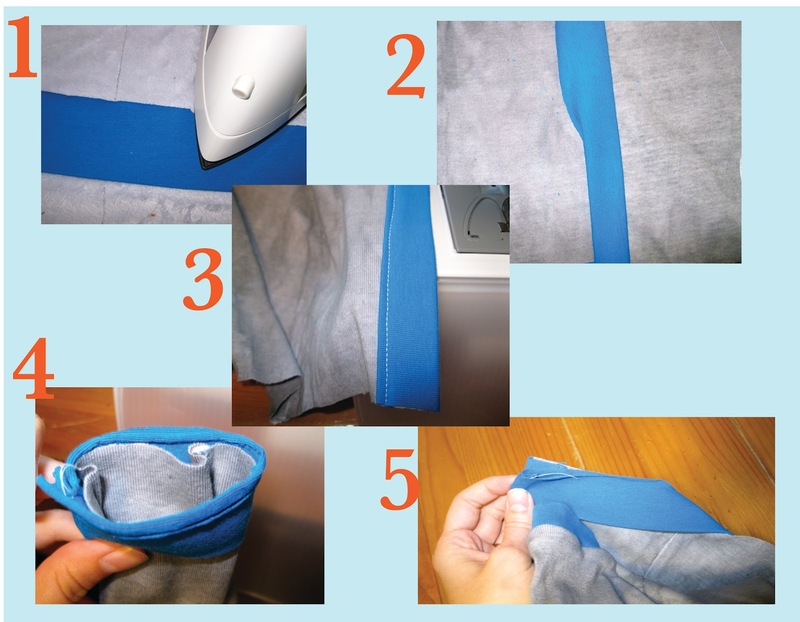 With it still folded length-wise, fold it again hamburger style and sew raw edges together. Slip that over the arm of the cardigan and line up raw edges. Sew those together without sewing closed your arm hole. Fold band down when you're done. Repeat for other sleeve. 5. Sew the two short edges of the bottom piece with right sides together. Flip right side out and line up the long raw edge with the raw base of the outside of the onesie. Sew raw edges together and flip the band down. Iron everything into place, sew on some buttons--maybe button holes if you're feeling ambitious--and you're done! Now try it on and attempt to get some cute photos of your very uncooperative model. This is so cute! I love clarks facebook worthy pose! I like your version of this. The buttons seem to go wonky towards the snaps in the other one. Plus this is a great use of those onesies where the snaps tear away from the body. Thanks for sharing. Cute, I think I've got some hand me down onesies that could use a cute update. Great job! This is so cute! I love how you added the band. I'd love it if you added it to my facebook page with a link to your tutorial!